I love finding interesting weather facts. The ones that I’m going to share with you in this post (unfortunately) have nothing to do with pretty rainbows, awesome sun dogs, amazing clouds, or beautiful sunsets. These facts cover some of the most dangerous and deadly weather conditions that many of us face each year. I’m talking about rain, snow, cold snaps, heat waves, lightning, hail, strong winds, tornadoes, hurricanes, and other deadly forces of nature! You may be shocked to learn that in the United States alone, weather is responsible for killing more than 2,000 people each year. 2/3rds of all weather deaths are caused by cold weather. 31% of weather-related deaths are related to heat or heat stroke. 6% of weather deaths are caused by the incidents we most often hear about on the news: storms, lightning, and floods. Of course, knowledge is power. If you know the fury that Mother Nature can unleash, you may be better prepared to handle it and save your life as well as the lives of the people you love and care about. #1 – Men and boys account for 2/3rds of all weather-related deaths. #2 – In the United States, 60% of flood deaths are among people who are trapped in their vehicles. #3 – Floods kill 127 people in the United States each year. #4 – About 100 people in the United States die each year due to rip currents. #5 – Some lightning bolts carry 100 million volts of electricity and can be as hot as 50,000 degrees – that’s hotter than the surface of the sun. 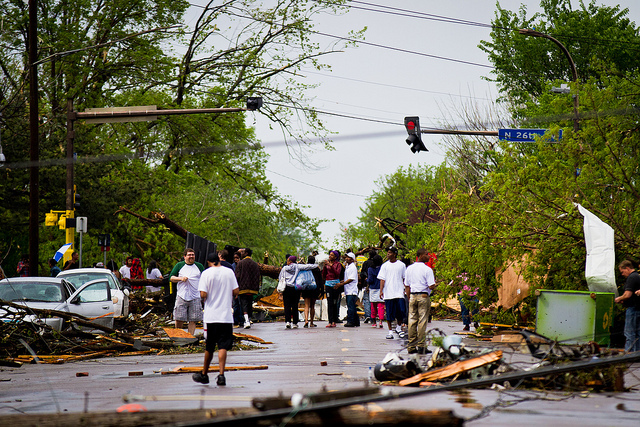 #6 – Tornadoes kill about 70 people each year. #7 – Winter storms claim about 60 lives each year due to heavy snow and icy conditions alone; that doesn’t count the number of people who die from hypothermia. #8 – High winds kill about 55 people annually. #9 – Cold air causes about 30 deaths each year. #10 – The 1970 Bangladesh cyclone killed more than 300,000 people. #11 – The Storm of the 20th Century (also called the “No Name Storm”) was a massive blizzard that killed around 300 people and brought snowfall from Florida to Maine. #12 – There are around 1,000 tornadoes in the United States each year. #13 – Of all the deadly tornado events that have occurred, the deadliest tornado to strike the United States was the Tri-State Tornado, which touched down on March 18, 1925 and tore through several counties in Missouri, Illinois, and Indiana, killing 695 people. #14 – A massive heat wave during the summer of 2003 killed more than 35,000 people in Europe. #15 – When Hurricane Katrina ravaged New Orleans and other communities along the U.S. Gulf Coast in 2005, the storm killed 1,836 people. #16 – The odds of being struck by lightning in the United States during any given year are 1 in 1.9 million. #17 – The odds of being struck by lightning in your lifetime is 1 in 12,000. #18 – Estimates suggest that between 6,000 and 24,000 people around the world die by lightning strikes each year. #19 – A severe 5-day bout of smog in London during December 1952 killed more than 4,000 people and caused illnesses in 100,000 others. #20 – The 1900 hurricane that tore through Galveston, Texas, killed more than 6,000 people, making it the deadliest hurricane to strike the United States. #21 – The Great Hurricane of 1780 was the deadliest Atlantic hurricane on record, killing more than 22,000 people in the Lesser Antilles, Puerto Rico, Hispanola, Bermuda, and possibly some U.S. states, including eastern Florida. #22 – In August 1769, a single lightning bolt was responsible for the deaths of more than 3,000 people when, after hitting the Church of San Nazaro in Brescia, Italy, the electricity explosively surged through a vault containing 207,000 pounds of gunpowder. #23 – The disaster of Pan American Flight 214 on December 8, 1963, was caused by a lightning bolt that struck a fuel vapor mixture in an onboard reserve tank; the airplane exploded in midair over Elkton, Maryland killing all 81 people on the plane. #24 – Roy Sullivan, a one-time park ranger, had been struck by lightning an incredible 7 times (and survived each strike); he held the record for the person struck by lightning the most times. #25 – In 1972, a single blizzard in the lower Caucasus and Iran killed 4,000 people and destroyed 200 villages. #26 – A terrible 1979 hail storm in Fort Collins, Colorado, littered the ground with hailstones measuring the size of a grapefruit; the hail injured 25 people and killed 1 baby being carried in the arms of her mother who was running to seek shelter. #27 – The most recent hail fatality in the United States occurred in the year 2000, when a 19-year-old man died from head injuries when he was hit by softball sized hail in Lake Worth, Texas. #28 – On December 11, 1990, dense fog on a stretch of Interstate-75 in Tennessee led to a 70-car accident that killed 13 people. #29 – A dust storm sweeping along Interstate-5 in California impaired visibility, leading to a pileup involving 104 cars and killing 17 people. #30 – A winter storm on February 22, 2000, brought whiteout conditions along Virginia’s stretch of Interstate-95, where 117 cars collided — 1 person died and 31 others were injured. #31 – In the United States, 3.5 million people are diagnosed with skin cancer each year. Melanoma, the most dangerous form of skin cancer, represents 73,000 of those cases. The message here? Protect yourself from the dangers of sun exposure!